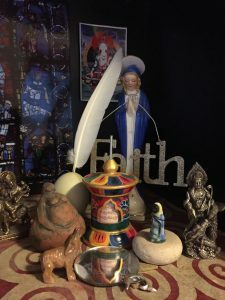 I am a seeker of light these days in the sun filtering through the fir and bay outside my window, the bright burst at that point up the hill on my way to my walk in the open space, the glow of the beeswax globe candle on my living room table. I welcome the lingering light edging toward 6:00 now. I am a seeker of light in the posts of my friends and my virtual friends making sense of world just now. I saw light in the glorious March in San Francisco, light in the faces of protesters at the airports, light in the words of the impassioned journalists stepping up again and again. What are we to do now? I crowd my altar with all the Goddesses. I remember my promise to practice what a life time has taught me about prayer and meditation. I remember that glow of December’s luminata. And I donate to the ACLU and listen for gatherings of the People. We are woke as the young ones say and in that awakening there is light come to marry the darkness and create a new world. This entry was posted in Uncategorized on January 30, 2017 by Judith.